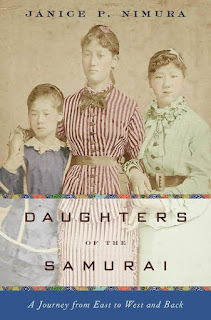 Janice P. Nimura is the author of the new book Daughters of the Samurai: A Journey from East to West and Back. It tells the story of three young Japanese women who spent the 1870s in the United States. 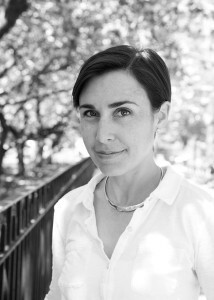 She is a book critic and independent scholar, and she lives in New York City. Q: You write that your research was sparked by a book you found in the basement of a library. What first intrigued you about that book? A: I had just finished a master's degree in East Asian studies, and had fallen into a fascination with what's known as the Meiji period of Japanese history, from 1868 to 1912. During these decades--in the space of a single lifetime--Japan hurled itself toward modernity: it was an identity crisis on a national scale. In the basement of that library--the New York Society Library, which has been circulating good reads since 1754--were several shelves of dusty Victorian volumes written by early Western visitors to Japan's newly opened ports. Their silly titles--"In Bamboo Lands," "Behind the Screens"--and breathless visions of the Mysterious East made me giggle. But one of them was different. It was slim and green and unadorned, titled, simply, "A Japanese Interior": a memoir by a straight-talking Connecticut schoolteacher, describing a year spent at a school for girls in Tokyo in 1888. Her name was Alice Mabel Bacon, and at first I thought I would write a book about her. She sounded like the wry bluestockings I had grown up with as teachers at my own all-girls school. But in her introduction was something strange: while in Tokyo, she said, she had lived not among foreigners, but with Japanese friends "known long and intimately in America." For a New Haven woman in 1888, this was really odd. It turned out that in 1872, when Alice was 14, her family had welcomed a 12-year-old Japanese girl, Sutematsu Yamakawa, into their home. Sutematsu would grow up as Alice's foster-sister for the next 10 years, and Alice's life would become closely entwined with hers and with the other two girls sent from Japan in 1872, Ume Tsuda and Shige Nagai. Alice's book turned out to be part of a much larger story, and a perfect lens through which to understand the turbulence of the Meiji period. Q: How did you conduct your research and come up with all the details you include about the lives of these women, and was there anything that particularly surprised you in the course of your research? A: After 10 years growing up in America, these three girls had lost much of their Japanese language and all of their Japanese literacy. For the rest of their lives back in Japan, they wrote in English--and they never stopped writing. They returned to a homeland that had become bewildering to them in their absence, and their friendships with each other and with their American foster families became emotional lifelines. They poured their doubts and frustrations and triumphs into their letters. These letters became the backbone of my research. Some were at Vassar College, where Sutematsu and Shige had been the first non-white students; some were at Yale, among the Bacon family papers; some at Rutgers, which welcomed some of the earliest Japanese students in the 1800s. And the largest trove was at Tsuda College, one of the most prestigious women's colleges in Japan, which was founded by Ume Tsuda with the support of Sutematsu and Shige in 1900. I was astonished by the intensity of emotion in these letters--they had been written well over a century ago, but the voices leaped off the page. And I was doubly astonished by how familiar their struggles felt. I'm a native New Yorker who never thought much about Japan until I married a Japanese man and moved to Tokyo for three years in my twenties. But I knew, like Alice, how it felt to arrive in Japan as a complete outsider and try to fit in. My husband, like the three girls, had spent most of his childhood in America, and had grown up culturally American while his family remained Japanese. There were so many resonances and echoes. Q: How would you describe relations between the United States and Japan at the time the three women--then young girls--first arrived in the U.S.? A: The 1870s were the height of Japan's lunge toward the West, but they were also a turning point for the United States, the decade of the American centennial. Up to this point America had been the upstart nation, struggling to prove itself. But now here came Japan, looking to America as a mentor, eager to learn all the systems and technologies that had allowed the United States to expand from the Atlantic to the Pacific. For the U.S., it was an immensely gratifying moment. What's interesting is the enormous gap between how the U.S. regarded Japan and how it saw China. The rhetoric of this period is startling. In the American imagination China was degraded, corrupt, crippled by opium, its immigrant laborers dirty, untrustworthy, and impenetrably alien. In stark contrast, Japan seemed a model of virtue and vigor, a nation with grit and goals, sending its aristocratic ambassadors to learn American ways so as to become the "Yankees of the East." American travelers in Japan were full of admiration for the nobility of samurai ideals, so reminiscent of the warriors of classical antiquity. Japanese arts, from ukiyo-e prints to ceramics and lacquerware, began to turn up in fashionable American parlors. The Japanese pavilion at the Centennial Exhibition in Philadelphia was a roaring success. The three Japanese girls actually visited there in 1876--I love the strange image of them in their conventional American attire, part of the crowd gawking at their Japanese compatriots. For its part, Japan at this point regarded the U.S. as a model of enlightenment--for a time in the 1870s, Benjamin Franklin and Samuel Smiles enjoyed bestseller status in Japanese. But by the 1880s, just as the three girls were returning, the conservative reaction was already starting to emerge: a turn back toward Confucian ideals and traditional attitudes that would continue to harden over time. Q: What does their story say about the role of women in Japan? A: Japan's ruling statesmen, the advisors to the Meiji emperor, were determined to convince the Western nations to regard Japan as an enlightened peer. The idea of sending girls to America in 1871 was part of this impulse: Western-educated girls, the thinking went, would come home and help spawn a new generation of enlightened men. As long as the Japanese kept their women uneducated and in the shadows, Western leaders would not be able to take them seriously. It was both an idea ahead of its time and a hasty afterthought. The three girls were lucky to find their way to progressive American foster families who encouraged them to soar as students, but when they returned to Japan, no one quite knew what to do with them. Get married, they were told. Japan's attitude toward women was changing, but it was still markedly Victorian: good wife and wise mother, rather than intellectual or world-changer. Two of them did marry, and all three contributed to the progress of women's education in Japan in different ways, but it's important to realize that they never strayed far from this good-wife-wise-mother paradigm--even the youngest, who remained stubbornly single and founded what became Tsuda College. She was an educator with a capital E, but she still believed that a woman's highest calling was a domestic one. It's an attitude that remains strikingly and dismayingly prevalent in Japan today. A: Though I was certainly looking for a story to tell when I found this one, it felt more like this story found me--once I had stumbled across it, it wouldn't let me go. Now that I've spent so much time in the late 19th century, I'm eager to return there. Soon I'll get back into a library and start exploring again, and with a bit of luck another story will reveal itself. My favorite way to learn history is through the forgotten people and events that contemporary writers breathe into life--writers like Laura Hillenbrand, Julia Blackburn, Erik Larsen, Nathaniel Philbrick. Taking a deep dive into the past, immersing yourself in the ephemera of another time--photographs, newspaper advertisements, letters, menus, tickets--is the closest thing to time travel. It's ecstatically fun, and I can't wait to do it again.